Arthur Ashe Jr. Sports Scholar Third Team. • Played in 27 games off the bench, averaging 13.0 minutes per game. • Had four games with 20+ minutes played (career-high 24 minutes vs. NC State on Feb. 7). • Averaged 2.1 points, 1.6 rebounds and shot 80 percent (20-of-25) from the free throw line. • Posted a strong 1.4 assist/turnover ratio with some ball-handling duties off the bench. • Career-high five rebounds in NCAA First Round game vs. Bucknell. • Four points and four boards vs. No. 9 NC State. • Added a career-best six assists vs. Wake Forest. • Career-high 11 points, including 8-of-8 from the free throw line, in win vs. Miami. • Recorded seven points and three assists at Boston College. • Totaled seven points in 18 minutes vs. Georgia State. • Drilled three 3-pointers in win over Penn State. • Scored first career points in big win over No. 12/14 Iowa, adding five points. • Made her collegiate debut vs. LSU, playing 15 minutes off the bench. • Missed the first four games of the season due to a hand injury. • Sat out her entire freshman season to rehab from a season-ending knee injury sustained during off-season workouts in September 2017. • Resumed to full speed after a rigorous rehab in the spring 2018. 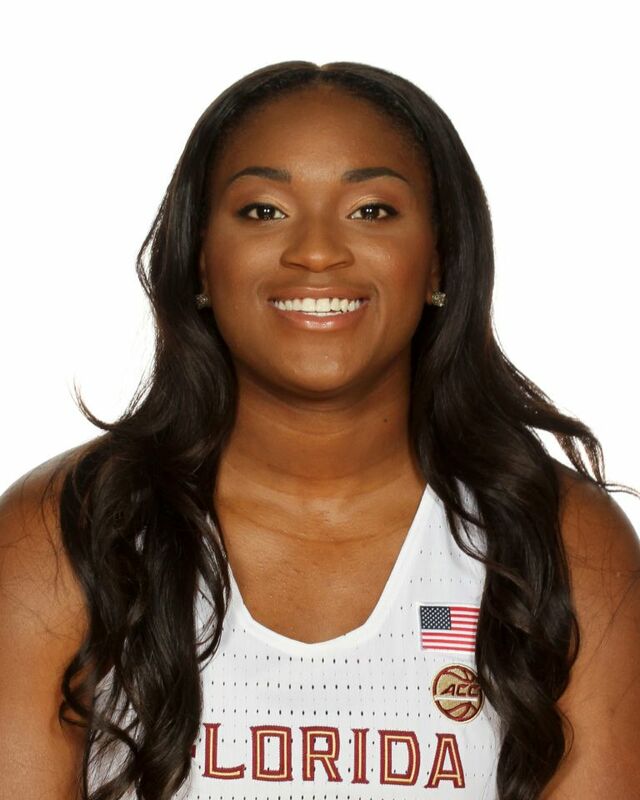 • Handled back-up point guard duties in August 2017 during Florida State’s Foreign Tour to Italy and Spain, impressing with her ability to distribute. • Learned behind redshirt senior point guard and Nancy Lieberman Award Top 10 Watch List member AJ Alix in the 2017-18 year. Talented play-maker who showed off strong leadership, great floor vision and good long-range scoring at the prep level. Becomes the second Massachusetts native to suit up for Florida State, joining former guard Michelle Frank (1993-94) of Sandwich, Mass. One of four Massachusetts natives named as a McDonald’s All-American Game nominee. Rated 19th among point guards in the 2017 class by ESPNW Hoopgurlz, earning strong reviews for her ability to excel in the up-tempo game. Poured in 1,023 points in three seasons at Newton North. Averaged 20.7 points per game while leading Newton North to the Division I State Tournament as a junior in 2015-16. Recorded 20 points per game as a senior while being named the Bay State MVP. Led her team to the Division I South Quarterfinals as a senior, contributing 31 points in a season-ending loss to Newton South. Uses her body well to draw contact and can also win 1-on-1 matchups on the offensive end with her knack for creating space. Played for the Boston Showstoppers AAU squad. Her Uncle Clinton was her AAU Coach, while her older sister Ednaija is a sophomore guard at Rhode Island. Began playing basketball in third grade as a member of her uncle’s AAU team, crediting him for her development while owing it to her sister for introducing her to the game. She has played alongside her older sister Ednaija ever since. The 5-foot-10 player has impressed colleges with being able to finish consistently in traffic, attack the basket and rebound well from the guard position. Lassiter is rated as a four-star player via Prospects Nation. Battled back from a season-ending knee injury as a freshman to enjoy an outstanding high school career despite missing her sophomore season. Received approximately 40 collegiate offers before deciding on Florida State, signing her National Letter of Intent on Nov. 11, 2016. Named to the Boston Globe Girls Basketball All-Scholastics five-member Dream Team as a senior. Parents: Natasha Lassiter and James Coakley. How did you first get into playing basketball? I played soccer initially, but then my sister convinced me to try basketball when I was 8-years-old and I’ve played ever since. Favorite song: Anything that is by Beyoncé. Explain a hardship you have overcome: Two ACL tears… sheesh! Most gratifying thing you have been a part of? I’ve helped at my grandma’s senior home, participated in Bingo Nights. Something many people don’t know about you? My little brother plays hockey and basketball. What is the best piece of advice you ever received? Don’t announce your every move. If I were a genie and granted you two wishes, what would those wishes be? If you were to win the $500 million lottery, what are some of the things you would do? I’d save it and pretend to be broke. If you could choose to give back to any cause, what would it be and why? Inner city kids because inner city school systems are terrible and everyone needs the opportunity to make money and receive proper education. What is the most inspirational story you’ve ever heard? How Jay Z went from selling narcotics to being a successful billionaire.